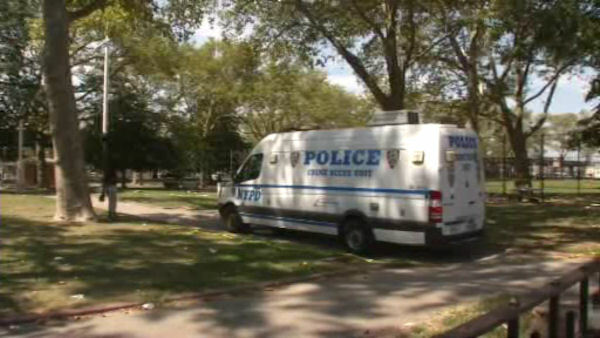 GRAVESEND, Brooklyn (WABC) -- Police say a man was fatally shot while attending a party inside a park in Brooklyn. The shooting occurred at about 1:30 a.m. Sunday inside Scarangella Park at Avenue V and Stillwell Avenue in the Gravesend section. Authorities say a gunman walked up to the 30-year-old victim and shot him in the head, then continued shooting while the victim was lying on the ground. The shooter fled the scene in a black colored vehicle, investigators say. The victim was pronounced dead at Coney Island hospital. The park is named after John Scarangella, a fallen NYPD police officer who was shot to death along with his patrol partner while they sat in their police car on a Queens street in 1981.